After an interesting tour of the major landmarks of Trondheim, we arrive at the Granåsen Ski-jumping Arena where thrilling events such as the Nordic combined World Cup and the Ski-jumping World Cup took place. We leave the port by coach and head for the city centre. Here we visit the crowded Market square, where there is also a statue of Olav I of Norway, the Viking king who founded the city. We continue on our tour on the Munkegata (Monks Street), the broad avenue which leads to the Cathedral. We then come to Nidaros Cathedral, originally built in 1070 but subsequently restructured on numerous occasions which have given it a Gothic-Romanesque style. It is one of the most beautiful and imposing cathedrals in the Scandinavian peninsula and the best preserved Gothic building in Northern Europe. 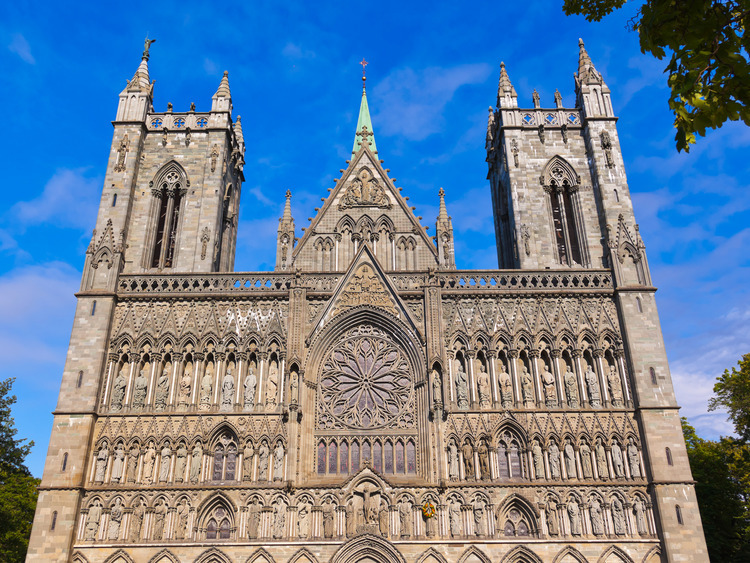 Trondheim and the whole of Norway are very proud of this magnificent Cathedral. After visiting the Cathedral we have a break in a panoramic belvedere. We then proceed to the Granåsen Ski-jumping Arena. The ceramic surface of the slides and the artificial turf enable access to the trampoline throughout the whole year and not just during the winter. At this point we go to the Sverresborg Trøndelag Folkmuseet. This open air museum illustrates everyday life and traditions of the Trøndelag region. A selection of buildings from all over the region were dismantled and then reassembled in the museum, in order to provide real insight into life and the architectural style of the past. After this visit we return to the port by coach. In case of inclement weather appropriate clothing is recommended. As this excursion is conducted mainly on foot, you are advised to wear comfortable shoes.